A slightly more bullish tone was seen in the overnight last night with soymeal leading the way. This will be the last you hear from me this week, markets are closed tomorrow for Good Friday. Overnight markets will resume trading Sunday night as normal. Weather, a weaker dollar story and short covering appear to be the drivers on the CBOT while cotton markets remain sideways, trading in a very tight range since 73 cents was broken and the recaptured last week by Dec futures. CORN: Corn sales came in below expectations, at 750,000 MT. We were expecting between .9-1.4 mmt. The image below is the “concern” right now for the corn market. While April rains are not correlated at all with final yields, the lack of progress expected in corn planting over the next two weeks is enough to push some of the shorts out of the market. July corn futures, trading at 377 right now appear to be making a run to 383 where the 200 day MA lies. July 17 corn futures have spent exactly three weeks above this average since contract inception. We have seen the MA mark the highs 3 separate occasions in the last two years. To get above that level and streak, we need something more than planting delays in my opinion given the amount of product for sale here and in South America. Folks with basis contracts written for May delivery should probably take 380. 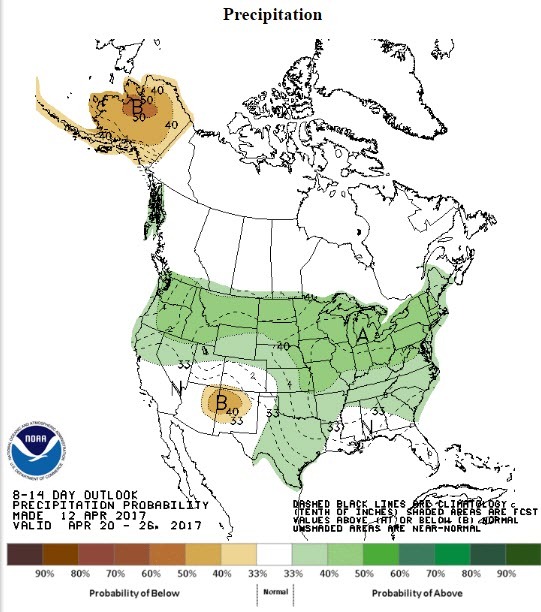 If the forecast would call for a dry out, the market probably moves back into the recent pattern. Basis remains weak across the US. Right now the forward precip looks like this. These drop around the noon hour eastern time. Soybeans: Soybean exports came in just shy of expectations. We are seeing a China based rally in both meal and soybeans. We received Chinese export news last night, China’s exports were up 16.4% in March from a year ago, this tells us China is rebounding economically. Chinese bean imports for March came in at 6.3 MMTs, a record. The supply story in beans remains bearish but I would not put a run back to 10.00 out of the equation until we get better US data. The Brazilian farmer holds the product in Brazil and we could see them tighten their fists as prices remain near 5 year lows in real terms. If you peeled off shorts, good on ya…if you did not, I might look at some cheap calls to keep sanity if weather problems reign. WHEAT Not much news in wheat, other than exports that came in on the lower end of expectations. Product remains moving at the ports but not at the pace it needs to. Weather in Spain and France look to remain dry in the short term but longer term forecasts show some moisture. April precipitation is well above average in Kansas already, with more on the way. It is shocking to say this but it appears that at this point Kansas wheat production may approach year ago levels. HRW values are in the toilet and the last thing the burdensome supplies here need is a record crop. The only thing keeping wheat prices interesting is the massive short position by funds and the rising commodity complex led by crude oil and gold. Something has to happen overseas via weather and I am not sure we even see demand if that’s the case. I am hopeful but not optimistic. Call options are still interesting here given low volatility levels and the assistance they provide is selling into uncertainty. Just a reminder, prices traded near 5.00 a year ago going into the harvest in front month. These prices do reflect current fundamentals pretty well. COTTON: Like wheat, cotton markets appear to be trading at the whim of spec money and the US dollar. Exports were strong, near 307,000 but about 25% lower than last week. Cotton markets have little to trade around other than currency (Trump wants a weaker USD, bullish cotton) and forward planting forecasts. I think we stay range bound for the short term in old crop. New crop probably stays in trend and starts to bleed a little as the fund long resets.